Thornton remains acting assistant secretary and has been involved in arrangements for the presidential summit between President Trump and North Korean leader Kim Jong Un later this month. But her Senate confirmation as assistant secretary is stalled in the Senate Foreign Relations Committee despite being nominated six months ago and taking part in a contentious hearing Feb. 15. Thornton is facing criticism for conciliatory positions on U.S. policy toward China that conflict with the Trump administration's new tougher line on Beijing. Sen. Marco Rubio (R., Fla.), a member of the Foreign Relations Committee, is prepared to place a hold on Thornton's nomination should the committee hold a vote. "During the confirmation hearing and in written answers, the current nominee obfuscated or evaded when answering important questions about her troubling record of undermining America’s allies like Taiwan, failing to stand up to China’s efforts to impose its authoritarian will beyond its borders, including in the United States, downplaying human rights abuses in China, and favoring smooth relations with Beijing over ‎a bilateral relationship grounded in reciprocity and reality," Rubio told the Washington Free Beacon. "I am hopeful the secretary of state will ask the president to nominate a better candidate," he added. A committee spokesman said the nomination remains pending in the committee and provided no further information. Thornton, a career foreign service officer, did not respond to emails seeking comment, and a State Department official referred questions to the White House. A senior White House official said action is expected on the stalled nomination in the near future but the official declined to provide details. A second White House official said Thornton remained the president's nominee. "We have no new personnel announcements," the official said. U.S. government sources said the White House is considering a replacement for Thornton based on the Senate opposition. Additionally, Secretary of State Mike Pompeo could decide to pick another candidate for the critical policy post. Pompeo has said China is the most immediate national security threat to the United States. White House National Security Adviser John Bolton also is known to favor tougher policies toward Beijing than their predecessor, Army Lt. Gen. H.R. McMaster. One option being considered is to replace Thornton at State with Matt Pottinger, currently the National Security Council staff Asia policy coordinator. Thornton was nominated in December 2017 and her problems in the Senate began in February when she provided confusing answers to questions about her role in an incident in New York in May 2017 involving activities by four Chinese security officials. The FBI wanted to arrest the officials but was blocked by State Department officials concerned the arrests could upset relations with Beijing. The security officials had violated their transit visas by traveling to New York from Washington in seeking to pressure dissident Chinese billionaire Guo Wengui into returning to China and keeping silent about high-level Chinese government corruption. Under questioning from Rubio, Thornton provided conflicting answers to questions about her role in interagency discussions that led to blocking the planned arrests. During the Feb. 15 Senate hearing on her nomination, Thornton said, "I'm not sure that I was involved in that decision-making process, but I do know that it was an interagency decision and that there were interagency meetings on this issue that came to that conclusion." Asked if she recalled being involved in the interagency decisions, Thornton said, "I do not." But in later written answers to questions from Rubio submitted in April, Thornton asserted she was not involved in a conference call on May 26, 2017, about the planned arrests because she was out of the country. The four officials included Liu Yanping, a senior Ministry of State Security official, and Sun Lijun, vice minister of the Public Security Ministry, who were confronted by the FBI about misusing their visas first on May 24 at New York's Penn Station, and again on May 26 at JFK airport. The U.S. Attorney in Brooklyn had prepared charges and the FBI was set to arrest them at the airport. "I believe we should be extremely concerned about actions by foreign officials in the United States that would be inconsistent with U.S. sovereignty, and we should take action to address this issue," Thornton said in her written response to Rubio. Asked directly if she provided guidance or direction to State Department officials who were to take part in the May 26 conference call regarding the FBI plans for the arrests of the Chinese for violating their transit visas, Thornton said, "no, as I was out of the country on official travel at the time." During the Senate hearing, Thornton indicated she was aware of the meetings as they were held. "I mean, I was aware of the conversations that were going on at the time and after the fact," she said. "I did not weigh in." The written answers provide new details on the internal State Department discussions that led up to the decision not to block the FBI from arresting the Chinese officials. 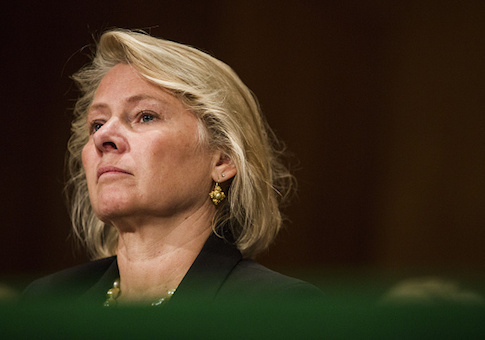 According to Thornton, Laura Stone, acting deputy assistant secretary of state for East Asia and Pacific affairs, took part in the secure conference call on May 26. "My understanding is that officials from [U.S. government] agencies, including Acting DAS Stone, participated in an interagency secure call on May 26," she stated in the written answers. "While I did not participate in the meeting as I was on official travel, I was briefed in a secure environment on the details of this meeting when I returned. The State Department would be happy to provide a classified briefing as a follow up to your question." Thornton said she was committed to "protecting U.S. sovereignty, and to working closely with the law enforcement community to ensure the safety and security of the American people and that China does not engage in law enforcement activity in the United States without U.S. consent." China has been conducting aggressive covert security operations against overseas Chinese suspected of financial crimes or political activities in the United States in recent years. During the Obama administration, counterintelligence operations against what China dubbed its "Fox Hunt" operations were largely ignored. Thornton also stated that Chinese President Xi Jinping made a commitment to President Trump in November to coordinate all Chinese law enforcement activities in the United States with U.S. authorities. Thornton did not answer directly when asked by Rubio if State Department officials objected to the planned FBI arrests in New York. But she stated "the State Department advocated for a strong and appropriate response, consistent with the Vienna Conventions." The Vienna Convention on Diplomatic Relations outlines international diplomatic privileges such as immunity from arrest. Thornton stated she could not provide a formal written "statement of conclusion" from the May 26 conference call because the teleconference was an impromptu secure call. A week after the May 26 conference call, the White House National Security Council convened a policy coordination committee meeting to discus the earlier call. Thornton again stated that she did not participate because she was out of the country. The Wall Street Journal reported in October that White House National Security Council staff intelligence director Ezra Cohen-Watnick confronted Thornton and said she had improperly blocked law enforcement agencies' in their efforts to deal with China's repeated violations of U.S. sovereignty and law. The newspaper stated that State Department officials criticized the FBI for failing to obtain the department's permission before taking action against the Chinese security officials. According to the report, Stone, the deputy assistant secretary, was worried about retaliation from Beijing if the officials were detained. She told officials her notebook had been confiscated upon leaving China during a recent visit. The Journal quoted Bill Priestap, FBI assistant director for counterintelligence, as quipping in response: "Was it because you had been trying to kidnap and extort someone in China?" Rubio also questioned Thornton about the State Department's decision to remove Taiwan's flag from two department websites. Thornton explained that the new websites initially included the Taiwan flag but stated that "we don't recognize, of course, Taiwan as an independent country, and we don't recognize the flag of the [Republic of China] as a country where we have official relations, and our policy is to not display the flag of the ROC on U.S. official government websites." She acknowledged however that State Department guidelines written in 2011 that allowed department websites to post the Taiwanese flag were modified in 2015 to require removing the flag. Thornton did not answer directly when asked if she authored, approved, supported or played a role in the new policy that conformed to Beijing demands. The two websites that were modified under the anti-Taiwan flag policy included a fact sheet on U.S.-Taiwan relations, and a page of travel advisories for Taiwan. Thornton stated in her written answers that it was "long-standing policy" not to display the Taiwan flag, yet acknowledged the policy change was made under her direction in 2015. The policy of not displaying the Taiwanese flag appears to conflict with a White House statement issued May 5 criticizing China for "Orwellian" political correctness in seeking to force U.S. airlines not to identify Taiwan as a separate destination from China in websites and hand-held apps. "The United States strongly objects to China’s attempts to compel private firms to use specific language of a political nature in their publicly available content," White House Press Secretary Sarah Sanders said in a statement. Thornton also would not answer directly when asked by Rubio if she supported sending U.S. warships to Taiwan under a new policy passed in recent congressional legislation that calls for closer military cooperation with Taiwan and more high-level visits. The United States is set to open a new diplomatic building in Taipei next month for the American Institute in Taiwan, as the official representative office is called. Rubio also pressed Thornton on her views on China's human rights abuses and increasing Chinese political repression in Taiwan. She promised the senator she would seek to pursue tougher administration policies on those issues.